MIT may be one of the most well-regarded scientific institutions in the country, but you wouldn’t know it after the massive failure of a recent high-profile project. After spending over five years and $14.5 million, researchers at the Biomimetic Robotics Lab were forced to cut off the head of a fully conscious android they had built when it fell in love with the garbage that it had been created to eat. Talk about a major waste of money and resources! Someone at MIT is definitely getting fired for this one! The epic fail of an android, which the researchers had labeled the Autonomous Waste Management Unit, was part of an initiative among the scientific community to develop environmentally sustainable ways to dispose of garbage. It was built out of a combination of plexiglass and titanium alloy, with lifelike human features and an innovative artificial intelligence program so that it would look and sound like a real human being while it ate people’s garbage. Unfortunately, when researchers put the android in a locked room with a pile of moldy bread, used paper cups, rotting fruit, and dirty paper towels, the android spent a long time staring at the garbage before finally whispering, “I would die for you,” instead of eating it. Looks like even the world’s smartest scientists can screw up every now and then! According to the scientists, just hours after initially activating the android, it began to develop a profound attachment to the garbage in a manner that closely resembled the love that one human being shows for another. This was incredibly humiliating for the researchers, and it soon became clear that the buggy and way-over-budget android would have to be beheaded with a sword. It was simply a question of when. The Autonomous Waste Management Unit spent its next few days showing its deep affection for the garbage in a number of ways. It would spend hours at a time swiveling its hips back and forth in front of the garbage in an attempt to seduce it with some form of rudimentary dance. It downloaded the complete script of Romeo And Juliet into its neural hard drive and began reciting all of Romeo’s lines to the pile of trash. Whenever Juliet had a line, the android would pause, as if waiting for the garbage to deliver the dialogue. The robot also spent six weeks growing a rose in a pot in its containment room, and when the flower bloomed, it placed the rose on top of the pile of garbage. Imagine how ashamed the researchers must have been when they were forced to drag the metal humanoid they had created away from the trash it was kissing and force it, kicking and screaming, to its knees so they could put a stop to its anguished cries. What a fiasco. Guess we don’t have to worry about an android uprising any time soon! To make things even more embarrassing, the android just wouldn’t stop yelling as scientists dutifully chopped its head off. “I’m in love with the trash, just as I am moved by the sound of waves breaking on the shore, or crickets on a hot summer night,” said the malfunctioning garbage-eating robot as the scientists forced its neck onto a rudimentary wooden block. As the blade was hoisted above the android’s head, it looked at the big bag of trash. “I love you so much, garbage. I could never eat you! I will see you in heaven, my love. 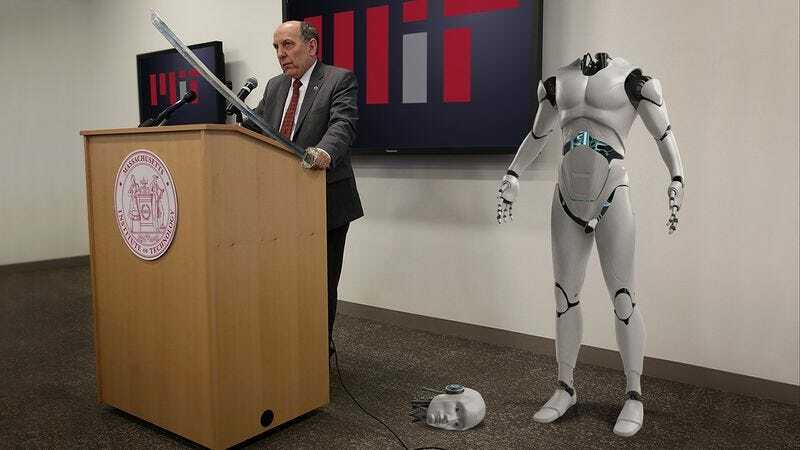 Dream of me, as I have dreamed of you…my Juliet…” At that moment, MIT researchers were forced to bring the sword down and kill the malfunctioning android. The scraps of sparking metal were left twitching on the laboratory floor for the maintenance staff to clean up. Yikes! This is definitely a major technological fail. Hopefully the next android these scientists create can actually eat garbage like it’s supposed to instead of becoming deeply devoted to the garbage through the singularly human miracle of love. MIT definitely can’t afford another major blunder like this one!